The Spa Within of Manchester, N.H., cares about its nail techs, so they created a unique workstation just for them. After long shifts performing multiple treatments, nail technicians can suffer pain and stiffness in their hands and wrists, and even eventual carpel tunnel syndrome, if their stations are not ergonomically correct. Additionally, people who sit all the time burn very few calories, and studies have linked this to obesity and other physical ailments. The Spa Within wanted their technicians to be able to adjust their positions throughout the day to have a stable and healthy blood flow to improve overall health, mood, and quality of life. The bar-style design allows both technicians and clients the choice of either standing or sitting during treatments. 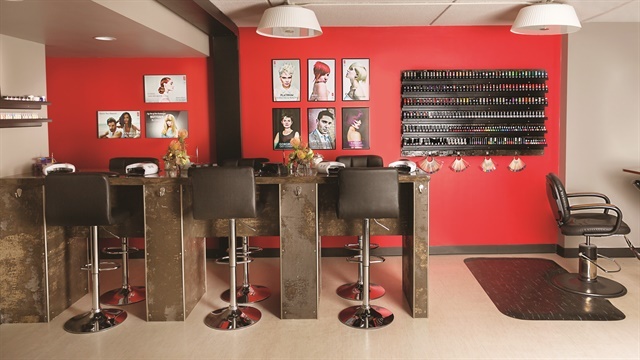 The customized nail bar was designed and constructed by Allen Hendershot of ADHCO, Inc.